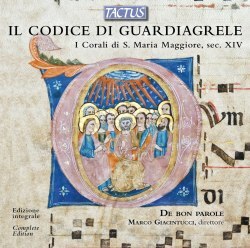 The manuscript recorded here and of which this is, claims the CD an ‘edizione integrale’ comes from the small town of Guardiagrele. This is near Abruzzo and is high up in the Maielle Mountains. Its cathedral S. Maria Maggiore is described as ‘once collegiate’. The manuscript, which comprises well over three hundred parchment sheets in three volumes contains mainly plainchant. In addition there are several pieces of anonymous polyphony in two and three parts from the 14th Century ‘ars subtilior‘ period. Some possible composers are suggested. The plainchant stretches across the church year from Advent up to Whitsun. There are also chants forming part of the mass ordinary. The third folio has chants suitable from St. Andrew’s Eve (29 November) until the feast of St. Clement, which is normally 23 November. I’m not quite sure if that means an entire calendar year of saints’ day pieces. I am also not clear how this single CD can therefore encapsulate a complete edition of the manuscript. Perhaps I’ve missed something. Anyway the seventeen tracks begin with an 'Alleluya' and the Advent prose Rorate caeli. There is then a Sanctus before we begin tracing our way through the mass from the Kyrie to the Agnus. These movements, sometimes in plainsong are separated by instrumental settings and dances as I have tried to make clear in the track-listing below. So how does it all span out? The opening two-part Alleluya is played on the bagpipe with a later added drumbeat and a recorder line. This makes for an arresting, start. There is another also rather sombre two-part Alleluya played by recorder and vielle with voices added half way through. Various plainchant offerings are included as with the Rorate caeli sung by the women and the Kyrie, Gloria and Benedicta et venerabilis. In fact the plainsong is the most impressive aspect of the singing which is enhanced by a palpable sense of an acoustic medieval space surrounding the voices. This sense is generally lost elsewhere on the disc. The instruments play an elaborated version of Sanctus 1. This develops into a Saltarello with the help of percussion in Sanctus II, where the expanded top line is played by vielle but without percussion. There is a third instrumental Sanctus played on the portative organ. There is even a fourth Sanctus setting that is in three parts but is played in a not very exultant fashion. The following Saltarello, which is based on the preceding Sanctus, pleasingly wakes us all up. On the whole, and I can’t decide if it’s the fault of this rather modest music or quite what, the instrumental work is rather dull except in the livelier dances, as I’m afraid is much of the singing. The Patrem is actually a singularly dull and lengthy two-part setting of the Creed. This is not helped by what feels like an aimless performance. A fifth Sanctus in two parts (track 12) is languid and is taken rather carefully. The voices try to add beauty and interest when they enter but the over-religiosity makes it drag so that the end comes as something of a merciful release. It is again a relief when the contrafacta instrumental version follows as another Saltarello. It was common practice in the Middle Ages to take a sacred work or even a plainchant and to change the words and often the rhythms to create a Contrafacta. There are a few tracks, as indicated, which demonstrate this. The very last is Landini’s well-known Questa fanciull’ amore played colourfully here with percussion and instruments. The two preceding tracks, each an Agnus Dei, use not only the melody but also the other two parts give or take various cadential accidentals. I have to say that these Agnus settings are not sung in a riveting or especially musical manner. In the case of track 16 I was quite relieved when it was over. Although this is potentially fascinating repertoire it has not on this occasion brought out the best from the musicians involved. There are no texts supplied but that is probably not a major concern. There is a detailed list of the instruments and the paintings that inspired their reconstruction. The essay by the group’s director Marco Giacintucci is very detailed and a little academic. This may leave a few readers scratching their heads. Its translation is also, in places, a travesty of the English language. I especially like the line “The story of the codex is tormented”.